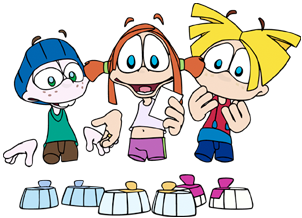 The show's characters "Junior", "Jaz", and "Jane"
Junior is a German children's television network. A programming block based on the network has been broadcast internationally. 30-second animated shorts, similarly titled Junior, were shown as wraparound segments between other animated series. In some countries, such as Australia, both the programming block and the animated shorts were called J-Squad. The wraparound animations were premiered on March 18, 2000. They center around the experiences of three kids: Junior, his sister Jane, and his friend Jaz. 300 animated wraparounds were created in total. The shorts were co-produced by the German company Trickompany and the Canadian company KLIK Animation for EM.TV. Directed by Bernie Denk, the short films were created using motion capture and CGI and given a 2D look using the program Illustrate. They were nominated for the Pulcinella Award. The programming block and wraparounds were shown in multiple countries and dubbed into several languages. In Australia, they were aired on Network Seven in 2002-2003, in Finland on MTV3 in 2001 and in Ireland on TG4. Some of the wraparounds were released on a now-out of print Australian DVD titled "The Best of J-Squad: Volume 1" along with three episodes of series which were shown as a part of the programming block ("Poochini", "What About Mimi? ", and "Weird-Ohs"). Some of the English versions of the shorts are available online, but not all of them. However, German versions of several wraparounds have been uploaded to YouTube by Mihai Tutaru. On October 26th, 2018, YouTube channel made 4 kids TV uploaded a video containing the English version of 4 interstitials. 4 English interstitials of J-Squad. ↑ DVD.net.au Review. Retrieved 6 Aug '16. ↑ www.davidgould.com – Junior Wrap Around. Retrieved 23 Apr '17. ↑ Programmes broadcast by TG4. Retrieved 6 Aug '16. ↑ MichaelDVD Review. Retrieved 6 Aug '16. ↑ EZYDVD Details of DVD. Retrieved 6 Aug '16.